Oh no. I missed it. I can’t believe it. Do you know what yesterday was? National Eat a Peach Day. Yup – there’s a day for that. I had every intention of getting this out in time. But I didn’t. In fact, I even have a bag of peaches here that someone gave me. I have no excuse. To be honest with you I don’t really know much about peaches. I always thought peaches originated from Georgia, I mean isn’t it called the Peach State? Well, I was wrong. No, not about the Peach State, but where they originated. Turns out peaches are native to China and they’re still the largest producer with Italy right behind them. In the United States, Georgia is the largest producing state and is called the Peach State because basically it’s the center for all things peachy. Whew, glad I got that straightened out. So peaches are considered a stone fruit because they have a large pit in the middle. There are two kinds of peaches – freestone and clingstone. Can you guess the difference? If you’re thinking it has something to do with the pit and flesh you’re correct. Freestone peaches have flesh that easily separates from the pit while clingstone – yup you guessed it – the flesh clings to the pit. Most of the time when we eat fresh peaches they’re the freestone kind. 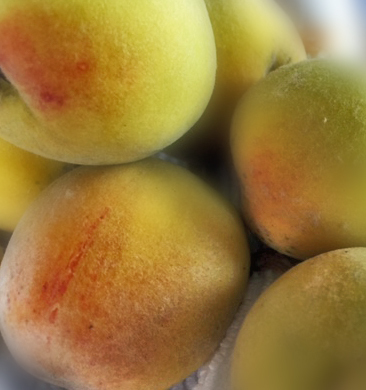 Peaches are starting to make their mark in the nutrition world. Not only will eating peaches help your skin glow, improve your mood and aid in weight loss, new research indicates peaches can inhibit the growth of breast cancer. Pretty peachy keen huh? I’m still debating what to do with my little peaches. I’d love to hear some ideas. How do you like your peaches?